SEATTLE, May 22, 2018 — AeroTEC has been certified by the Federal Aviation Administration (FAA) as an FAA Part 145 Repair Station (Air Agency Certificate No. 4T1R174D), the company announced today. The limited accessory rating, received April 2, means AeroTEC has been authorized by the FAA to perform maintenance, inspection and repair on aircraft accessories. This complements AeroTEC’s already robust flight test and certification capabilities, according to President Lee Human, who added that the company expects to receive an airframe and powerplant rating early next year. With locations in Seattle (engineering), and Moses Lake (flight test), Washington, the company has grown from 20 to 400 employees since 2015, largely due to its role in the Mitsubishi Regional Jet (MRJ) flight test and certification program, Human said. 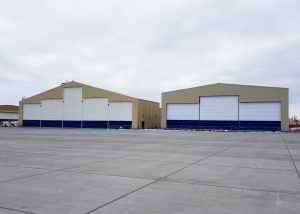 AeroTEC facilities include hangars for wide-body and narrow-body jetliners. In addition to its Part 145 certification, AeroTEC continues to enhance existing capabilities, such as rapid prototyping and manufacturing, CNC machining, composites and special test equipment fabrication, including advanced wind tunnel models, artificial ice shapes, trailing cone systems, and load banks. “Our vertical integration strategy means that we have all the people, equipment, capabilities and facilities needed to quickly react to unexpected events and minimize or eliminate delays,” Human added. AeroTEC develops, tests and certifies new aircraft products using innovative and scalable development, test and certification techniques to help large and small aerospace companies everywhere bring their products to market quickly, easily and efficiently.